We all know that IVF and other innovations can help infertile couples have children. But can science also help family structures emerge that have never existed before, like kids with three parents? It already has. Here are four examples. On the TV series Caprica, the pagan culture on an alien planet produces very unusual families. Gay marriage is commonplace, as are group marriages with multiple husbands and wives. These kinds of non-traditional families exist because the planet Caprica has a very different culture from Earth's. But today on our own planet, science is creating families that seem to be ripped from the pages of science fiction - or from futurist prognostication. Here are some of the unusual family structures that exist on our planet right now. 1. A child with three genetic parents. Two years ago, British scientists announced that they had perfected an IVF technique that would allow them to create children with three genetic parents. (Read their scientific paper here.) 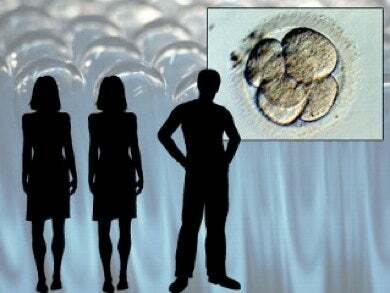 Using a process called ooplasmic transfer, which has already been used to created genetically-altered children, doctors inject mitochondrial DNA from one woman into the egg of another - and then inject a third dose of DNA from the father in the classical nuclear DNA transfer process. Presto - you have mitochondrial DNA from one woman, and nuclear DNA from another woman and the father. While ooplasmic transfer and nuclear transfer have both been done successfully, there are no reports yet on babies born who are the product of both. However, researchers say it is likely to happen within the next year because the process is sound and ooplasmic transfer can protect the baby from certain genetic diseases inherited from the mother. However, it is arguable that women whose children are the result of an egg donor have, in some ways, given birth to a child with three genetic parents. Although the child has the genetic material from two people (the egg donor and the father), the mother who carries the embryo in her uterus affects the way that child's genes develop and are expressed in the womb. So one woman (the egg donor) gives genetic material, but another woman helps to regulate the way that genetic material is expressed as the baby develops in her body. It's nearly a three-parent situation. 2. Children whose father gave birth to them. Thanks to medical science, men can now give birth. In fact, last year Thomas Beatie gave birth to his second child, a boy (the first was a girl). And he wasn't the first man to do it, either. How did it happen? Beattie is a transsexual man, which means he has all the hormones of a man and looks male. However, he also still has a uterus. Doctors used old-fashioned artificial insemination to get Beatie pregnant. 3. A child whose genetic parents are both female. This family structure doesn't yet exist among humans, but Japanese researchers have used genetic material from two female mice to create mouse babies. The baby mice had chromosomes from both mothers. Unfortunately for humans who want to create babies in this way, the technique the scientists used don't work on humans - yet. It does work on chickens, however. 4. 8 children born to the same mother, all of whom survived. The notorious "Octomom," Nadya Suleman, who gave birth to 8 children after undergoing fertility treatments, is purely a product of science. Though other women have given birth to large numbers of children - a woman in Australia had 9 in the early 1970s - they do not usually survive. In fact, there are no other recorded births of octuplets where all survived. Suleman's pregnancy is the direct result of in-vitro fertilization - a doctor implanted six fertilized embryos into her womb, which developed into 8 infants. Medical technology for aiding the survival for prematurely-born babies kept them alive. Science has created the first known complete group of octuplets in the world.